59 year old with 2 pregnancies and a total abdominal hysterectomy. 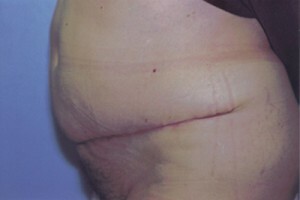 She also has a large ventral hernia 8 inches in diameter which was repaired at the same time of the tummy tuck. Photo's are at 6 weeks. She will be offered a small touch up at 8 months to obtain further improvement with lifting of her pubis and lowering the scar.